1. Preheat oven to 425ºF. Wash skinless chicken thighs and place on paper towel to dry. 2. In a medium saucepan, whisk together the orange zest, orange juice, garlic, ginger, rice wine vinegar, low sodium soy sauce, honey, brown sugar, sesame oil and crushed red pepper flakes (more or less, depending on your taste). Over medium heat, bring the sauce to a boil, turn down the heat to low, and cook for 5 minutes while stirring every now and again, to thicken the sauce. Remove from the heat. 3. Put chicken thighs into a baking dish in one layer. Pour about half of the sauce over the chicken thighs, turning them over a couple of times to coat them in the sauce. Finally put them with what would have been the skin side, down. Roast at 425ºF for 20 minutes. Turn the thighs over. Roast another 25 minutes. 4. While the chicken thighs are roasting, finely chop the Scallions and set aside. In a small, dry skillet, toast the sesame seeds while stirring until they release their fragrance and just start to turn golden. Set aside. 5. At this point, I crank up the oven to broil, brush the top of the chicken thighs with more sauce on (what would have been) the skin side up. Broil until brown and caramelized: watch carefully and remove them from the oven when they're sizzling crispy before the sugary sauce burns. 6. 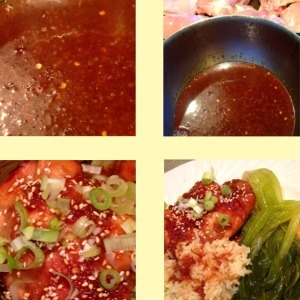 You may serve the chicken thighs drizzled with the extra sauce, and garnished with a sprinkling of toasted sesame seeds and sliced Scallions. 7. Serve with rice and a green vegetable side, like steamed Asparagus or baby Pak choi pan-seared in olive oil and braised in chicken broth until crisp-tender or wilted, as you prefer.